New degree apprenticeships will help to deliver higher level skills needed by the food manufacturing sector, thanks to a major funding award from the Government. 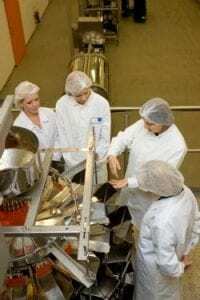 The University of Lincoln’s National Centre for Food Manufacturing (NCFM) will lead the pioneering project to deliver the country’s first degree apprenticeships in Food Engineering, Technical Management and Operations Management as part of a national programme to develop new opportunities for apprentices. NCFM, based in Holbeach in south Lincolnshire, has secured a share of the £4.5 million Degree Apprenticeship Development Fund to deliver the new courses in collaboration with Sheffield Hallam University and the National Skills Academy Food & Drink (NSAFD). Together, the organisations have formed the Degree Apprenticeship Food Industry Partnership. Funding for the new degree apprenticeships was announced today (Thursday 10th November 2016) by the Higher Education Funding Council for England (HEFCE). This first phase of the degree apprenticeships initiative will see the development of 18 projects involving higher education providers and employers working in partnership to develop apprenticeships ready for apprentices starting in September 2017. Designed by employers, universities and professional bodies, degree apprenticeships will deliver high-tech and high level skills and offer an alternative to the traditional degree course. Bringing together university study with paid work, degree apprentices spend part of their time at university and part with their employer. The Food and Drink Federation (FDF) and many leading food businesses including Nestle, 2 Sisters Food Group, Princes and Moy Park, are directly supporting the development of these three degree apprenticeship programmes, which are being developed to tackle the higher level skills gap in food engineering, technical management and operations management. Employers and students wishing to find out more about the new degree apprenticeships are invited to contact dafip@lincoln.ac.uk, or phone the Degree Apprenticeship Food Industry Partnership on 01406 493000.